Florida man shares with a large crowd in Sacamento his foreclosure to Fiji story he was able to create through a home business opportunity called Numis Network. “Back then if you had told me I would be honeymooning in Fiji less than 2 years after going through 8 foreclosures I would have thought you were crazy…but that is exactly what we did with Numis Network” says Ray Higdon. At a home based business convention in Sacramento on Sunday, March 4th, featured speaker Ray Higdon, a home business owner based out of Florida who just 24 months ago was just another victim of the economy and in personal foreclosure, shared his story of how he found financial salvation through a home based business called Numis Network. Numis Network is a Tampa based gold and silver network marketing company. “I really didn’t know what I was going to do”, says Ray Higdon,, “I had been a real estate investor since 2004 but when the economy changed, I just didn’t adapt fast enough.” Ray found himself not in just one but eight total foreclosures with his personal home being one of them. “When you are in that position you have a couple options, you can curl up in a ball and cry, or get to work. 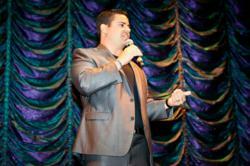 I got to work”, says Ray Higdon. Ray had been in other network marketing companies but had never had success. The reason he likes Numis Network is that the product was different and it was a newer company that most people still have not heard of. Ray started part time, but from following their recruiting system was able to go fulltime in his fourth month and has been fulltime since December of 2009. “Back then if you had told me I would be honeymooning in Fiji less than 2 years after going through 8 foreclosures I would have thought you were crazy…but that is exactly what we did with Numis Network.” In November of 2011 Ray and his wife spent 10 days at the resorts of Namale and Likuliku Lagoon in Fiji. “It’s pretty surreal”, says Ray Higdon, “that a little home business like Numis Network could generate this much income and completely change me and my wife’s lifestyles, but it has.” Ray admits that it wasn’t easy, but says it certainly has been worth it. Now Ray and his wife Jessica work with all kinds of financial planners, realtors, and mortgage brokers that have been affected by the economy that are looking for alternative ways to make an income. Ray told the captive Sacramento crowd that the cool thing with Numis Network is that anyone can follow the system and it is something that has never been done in Network marketing before with a product of government issued, graded gold and silver coins. “When I started I had no clue about gold and silver and really didn’t understand how to market Numis Network online but the company and the different leaders taught me what to do and I just followed the system” says Higdon. “Back when I started my wife was working at a local department store to pay our utility bills, but now we both are fulltime with Numis Network and it is a dream come true”. Now Ray and his wife have been able to travel to Hawaii three times, travel to Vail, as well as win 7 fully paid for vacations in the last two years. Ray says most of his friends were skeptical, as was he, as to whether or not this would ever turn into something big, but in his tenth month he won a brand new BMW 7 series (a $96,000 car) and has never looked back. “I would suggest that anyone that has been affected by the economy and is looking to make extra money take a look at Numis Network. If Numis can help a guy with eight foreclosures, terrible credit and no college degree, it can help anyone”. Ray Higdon is a speaker and trainer for the Home Business Industry. His blog, http://www.RayHigdon.com, gets almost 2 million hits per month and 40,000 unique visitors per month. He is also the number one earner for Numis Network and shares his story of Foreclosure to Fiji with audiences all around the world.